The Exploratory Advanced Research (EAR) Program addresses the need for longer term, higher risk research with the potential for long-term improvements to transportation systems—improvements in planning, building, renewing, and operating safe, congestion-free, and environmentally sound transportation facilities. The EAR Program seeks to leverage advances in science and engineering that could lead to breakthroughs for critical current and emerging issues in highway transportation—where there is a community of experts from different disciplines who likely have the talent and interest in researching solutions and who likely would not do so without EAR Program funding. The results of EAR Program–funded projects may include new fundamental insights and how they can be applied in highway transportation; new research methods, models, or data that can accelerate applied research; or new system concepts or prototypes, including laboratory testing and possibly limited field testing. The program does not fund projects through commercialization or deployment. Rather, results must be taken up by the research community, with the support of other funding sources. FHWA is committed to transitioning the results of EAR Program-funded projects and takes an active role in demonstrating results to audiences critical to continuing the research and development cycle. Through seven solicitations, the EAR Program has awarded 59 projects (36 of which are ongoing as of September 2013) involving both government and academic researchers. These projects represent the investment of $50 million in FHWA funds and leverage $19 million in matching funds. Additional projects will be funded in 2014. The following pages contain summary descriptions of the results of selected recently completed research investigations. IMPACT: As automated vehicles come onto the market, results from this project have the potential to provide a safe system for improving traffic flow and dramatically reducing fuel use and mobile source emissions at intersections. To develop and evaluate candidate freeway merge assistance systems that might improve the efficiency and safety of freeway merges in a connected vehicle environment. To provide ubiquitous, precise positioning in regard to vehicle safety and automation in the presence of Global Positioning System (GPS) degradation. RESULTS: The project team developed an integrated vehicle positioning system in which subsystems with complementary strengths are fused to provide precise positioning data in environments where one or more of the subsystems could fail. The subsystems assessed were GPS, inertial navigation systems (INS), camera and LIDAR lane departure warning systems, a dedicated short-range communications distance estimation system, visual odometry, and a road fingerprinting system. The accuracy and robustness of integrated systems were evaluated in test track and roadway scenarios under various weather conditions and at various speeds. The subsystems helped to improve lane-level accuracy. In live tests, GPS/INS integration provided improved results over standalone GPS, particularly in heavy foliage and urban canyon environments, and the full system of sensors performed best overall. RESULTS: No single positioning technology can meet the requirements for lane-level positioning across diverse driving environments—each has performance limitations. 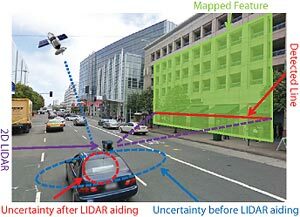 This project explored the most promising technologies for improving the accuracy, availability, and reliability of vehicle positioning by augmenting Global Navigation Satellite System/Inertial Navigation System technology. 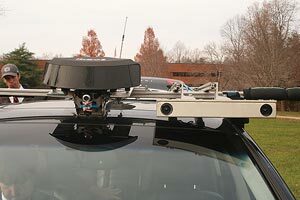 After evaluating the performance of aiding technologies (LIDAR, radar, computer vision, and dedicated short-range communication (DSRC)), the research team developed and tested prototype systems that integrate a variety of sensors. The team found that LIDAR and radar technology integrate with the quickest processing and response, and terrestrial radio navigation and DSRC methods require more time. Radio and DSRC-based methods show great promise because implementation costs are relatively low, but require further development to improve accuracy. 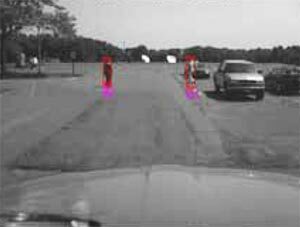 The performance of vision-based aiding improves with increased sensor cost; however, implementation requires development of onboard feature mapping. connected vehicles and infrastructure to monitor and share safety-related information. To estimate how system errors, communication delays, and communication interruptions affect the timing of warnings, driver perceptions/reactions, network-wide delays, and safety, the team simulated warning scenarios for eight sensor system combinations. The team found that error- and delay-free driver warnings reduce the number of conflicts in the range of 28 percent to 50 percent. The project compared different positioning approaches for overall accuracy and for providing the fewest false and missing warnings. 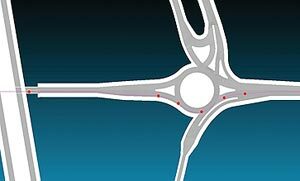 a vehicle’s location, speed, and characteristics, as well as communication to the signal control infrastructure. IMPACT: The project results show great potential to advance real-time signal control strategies in some cases with low levels of new technology adoption. Improved efficiency will reduce travel time, frequency and length of stops, fuel consumption, and harmful emissions. tracking pedestrians at vehicle speeds of up to 48 km/h (30 mi/h) and distances up to 35 m (115 ft) away under good visibility conditions and up to 25 m (82 ft) away under reduced visibility with a 90-percent overall positive detection rate. The researchers recommend further development to upgrade performance. The feasibility of commercial implementation is high, since the system uses low-cost components. RESULTS: The project team modeled, tested, and demonstrated prototype wireless communication systems to improve traffic flow by calculating and communicating variable speed limits (VSL) to drivers; achieve higher effective lane capacities using cooperative adaptive cruise control (CACC); and reduce fuel consumption and increase truck-only lane capacity with automated platoons. 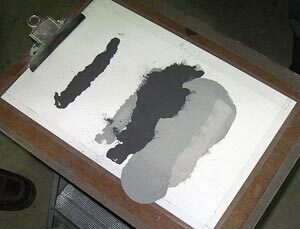 RESULTS: Large-scale experiments demonstrated that high-volume fly ash (HVFA) concrete can be produced to have setting times and early-age compressive strength development comparable to conventional portland cement concrete. In experiments with HVFA replacement volumes of 40 percent and 60 percent, researchers found that lower water-to-cementitious materials ratios and internal curing (adding pre-wetted lightweight aggregates that release water to the matrix after time of set) improved early-age strength and reduced early-age cracking. Other project studies examined materials compatibility, prediction methods for property development, improved freezing and scaling durability, and activation energy values of cementitious materials. Technology transfer activities in the project will guide agencies and contractors in using HVFA in concrete mixtures. RESULTS: The research team identified highway design needs and matched them to specific characteristics of driving simulators (e.g., motion, field of view, speed, and steering torque) and developed and demonstrated tools to characterize how closely responses to simulator characteristics match real-world driving outcomes. 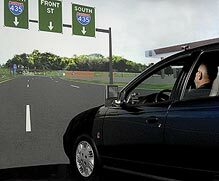 In experiments conducted on four different simulator platforms, the researchers compared driver judgment of simulator fidelity and performance in virtual roadway scenarios and found little effect of motion and a moderate effect of visual complexity. The results show that using a high-fidelity simulator, with attention to accurately rendering the visual complexity of the roadway, will lead drivers in the simulator to drive at speeds quite comparable to those observed on actual roadways. IMPACT: Models developed in this project will enable the driving safety research community and highway designers to predict real-world driving behavior more accurately from behavior in driving simulators and to integrate the results from different simulators more readily. The models also will better indicate to researchers when experiments require high fidelity simulation and when lower fidelity approaches are adequate, thereby saving time and funding on future studies. Presentation at http://www.transportationeconomics.org/meetings — open the link “An Experimental Economics Investigation into Responses to Congestion Pricing, Harb. RESULTS: To improve understanding of when and why drivers choose a tolled facility, the research team used experimental economics with a population of local drivers and students participating in (1) stylized lotteries to reveal risk attitudes; (2) driving simulators to reveal risk attitudes and travel time perceptions; and (3) GPS-recorded actual driving choices. More than 550 drivers with residence and workplace connected by both a toll and a “free” route participated in Orlando, Florida, and Atlanta, Georgia. They responded to varying road prices in actual driving and simulations to assess their risk attitudes and travel time biases in response to monetary incentives. In another experiment, 210 college students participated in driving simulations of route choices to test whether their behavior could predict field driver behavior. The study concludes that risk attitudes are comparable across tasks and regions, and in college students versus field drivers. The researchers found evidence of risk aversion as captured both by sensitivity over values of route choices and by pessimism over likelihoods of congestion. IMPACT: Currently revenue projections for priced roadways are based on methods with limited accuracy, which can result in projects with lower than expected revenue. The results of this research confirm the importance of accurately incorporating risk attitudes in policy analysis and impact assessment of congestion pricing. The use of less-costly subject pools and instruments to gather behavioral data as demonstrated in the project can increase opportunities to investigate driver choices and incorporate more accurate data when determining potential revenue. To evaluate whether innovative pedestrian, bicycle, and transit facilities and services will attract travelers and decrease passenger car travel. IMPACT: This project provides the framework and tools for policy makers to understand issues such as freight and the economy on a megaregional scale and demonstrates that analytic tools can be developed with available data and at reasonable cost for megaregional analysis. Final report at http://www.ntis.gov. Search: PB2012-105330. RESULTS: This research provides a foundation for agent-based modeling of driver behavior based on naturalistic data through an integrated framework for safety and operation analysis. Lateral vehicle action was simulated in a microscopic traffic behavior modeling environment, bringing new insights to the modeling of driver maneuvering behavior during safety-critical events. Agents developed and evaluated in the VISSIM simulation platform revealed a close resemblance to real driver data. The project team improved car-following models through development of a hybrid model for greater accuracy and flexibility and through the addition of the new “passing and hook-following” thresholds. They used the model to simulate vehicle actions in safety-critical events, developed agent-based simulation components integrated with the VISSIM simulation package through its driver model, and developed and implemented a robust activation mechanism for agent-based simulation based on discriminant analysis. The investigators also identified key future research issues: adaptability of agents in real time and human factors issues related to warning individual drivers about changes in their driving behavior that might lead to safety-critical events. IMPACT: New behavioral models are necessary to predict the safe and efficient use of new connected vehicle and roadside technology. This project demonstrates the ability of agent-based models based on naturalistic driving studies to create new and improved behavioral models. RESULTS: SimTRAVEL, developed in this project, is an integrated modeling system that advances land-use and transportation microsimulation by providing seamless modeling of longer term choices about location (home, work, school) and shorter term choices of activity, travel mode, and route. SimTRAVEL integrates the use of UrbanSim (a land-use model), OpenAMOS (an activity-based microsimulation model), PopGen (a state-of-the-art synthetic population generator), and DynusT/MALTA (a dynamic traffic assignment and microsimulation model) within a behaviorally robust framework. The integrated systems have been fully implemented in a user-friendly software environment with powerful graphical user interfaces and visualization dashboards. Open-source software architecture with multithreading and parallel-computing capabilities speeds the simulations. SimTRAVEL was successfully tested and validated on a 500,000 population subregion of Maricopa County, Arizona. “Passive Wireless Antenna Sensor for Strain and Crack Sensing—Electromagnetic Modeling, Simulation, and Testing,” Smart Materials and Structures, vol. 22, p. 085009, 2013, at http://iopscience.iop.org/0964-1726/22/8/085009/. “Passive Wireless Smart-Skin Sensor Using RFID-based Folded Patch Antennas,” International Journal of Smart and Nano Materials, vol. 2, pp. 22–38, 2011, at http://www.tandfonline.com/doi/full/10.1080/19475411.2010.545450#preview. RESULTS: The research team has developed several types of wireless, self-powered, low-cost antenna sensors that can monitor potentially dangerous cracks in steel bridges. To reduce the costs of large-quantity production, multiple sensors are printed with inkjet printers and nanoscale conductive inks onto a thin, flexible film that can be applied to fatigue-prone areas of a bridge. The sensors create a network that can detect and measure multiple small cracks in proximity and their propagation. Powered by solar cells or energy captured from the signals of a wireless reader, the antenna sensor systems have great potential for low-cost, large-scale monitoring of transportation structures. IMPACT: The research results demonstrate the potential for designing low-cost, advanced strain-sensing systems that can improve the efficiency of maintenance and repair for steel bridges, provide substantial savings in operations, and increase safety. 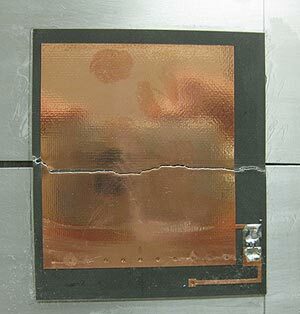 RESULTS: In this project, the Jet Propulsion Laboratory conducted research on an integrated, flexible-skin, areal shear- and pressure-sensor system in a miniaturized array that measures changes in shear stress and pressure associated with scour-hole formation. The sensor elements were intended to measure shear forces in the range of 0.05 to 6 Pa and variations in pressure in the range of 0 to ±100 Pa, with a sampling rate of more than 500 data points per second. Such a system will help researchers understand erosive flow mechanisms related to turbulence structures, together with local flow convergence and contractions around the fronts and flanks of piers or between piles of complex pier configurations. Direct measurements of shear forces are essential to validated computational fluid dynamic models. IMPACT: Scour is the predominate cause of failure in bridges over water. 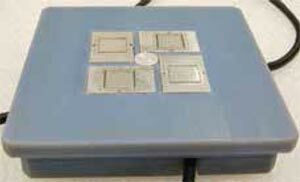 The ability to capture shear stress and pressure data will significantly aid small-scale scour experiments in bridge scour research. 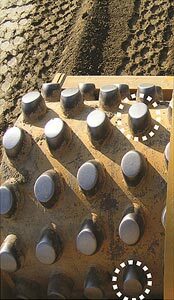 Strain gages, installed within selected pads that are welded to the drum, are wired to a signal processing box that transmits data wirelessly to a computer in the cab. The EAR Program strives to develop partnerships with the public and private sectors because the very nature of EAR is to apply ideas across traditional fields of research and stimulate new approaches to problem solving. The program bridges basic research (e.g., academic work funded by National Science Foundation grants) and applied research (e.g., studies funded by State departments of transportation). In addition to sponsoring EAR projects that advance the development of highway infrastructure and operations, the EAR Program is committed to promoting cross-fertilization with other technical fields, furthering promising lines of research through dissemination and continued investigations, and deepening vital research capacity.